Ballpark Basics: A modern house for a storied team. 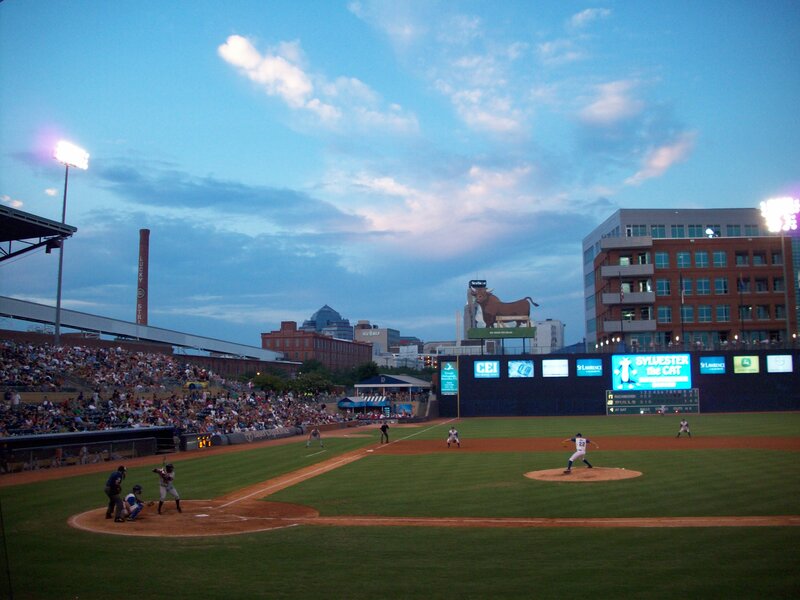 Made famous by the 1988 classic film Bull Durham starring Kevin Costner, Tim Robbins, and Susan Sarandon, it is hard to think of a team more affiliated with minor league baseball than the Durham Bulls. Since 1995, the Durham Bulls have played at the Durham Bulls Athletic Park (or D-BAP as it’s known to the locals), it seats 10,000 and serves as a stadium worthy of such a well-known (flagship etc.) team. The ticket office sits outside the third base side of the park where you will find very helpful and friendly staff willing to assist you in finding just the right seat. On the day we showed up, the lady behind the desk asked us where we typically liked to sit and advised us on the best seats to avoid the glaring sun. Walking up to the home plate entrance of DBAP you are greeted by a large curved brick façade. The team store is on the first level right as you walk in and a set of stairs on either side take you up to the main concourse. 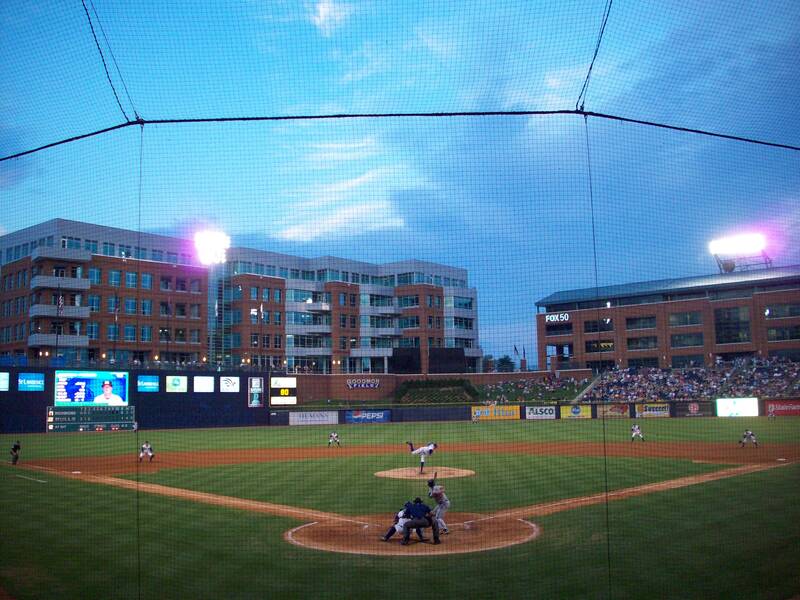 While the gift shop is not legally allowed to stock the most famous Bulls of all time (“Crash” Davis and “Nuke” Laloosh) you can get one of the Durham Bulls t-shirts or jerseys personalized with a “Davis – 8” to get around the legal hang up. Take either set of stairs up to the concourse which sits behind the stands so you can’t see the field as you go for refreshments. However, there are HD televisions throughout the park so you can watch the action while in line or in the gift shop. There is also a wide walkway that separates the lower bowl from the upper seats and most people use this to walk around during the game. The aisle is so wide that there is actually a place behind home plate where the organist sits throughout most of the game. With recent renovations the concourse now wraps around the entire park so you can watch the game from any area. Touring DBAP, you will notice a few features that bring to mind features of a few other classic parks. For example, left field wall is 32 feet tall and affectionately named the Blue Monster as a tribute to Fenway Park’s Green Monster. A manual scoreboard, large digital screen and printing labeling the wall “Blue Monster” accompanied by a set of menacing eyes, complete the wall. 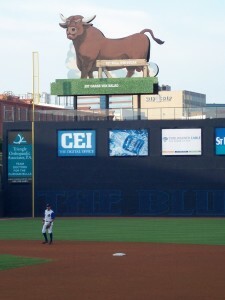 Of course it would be sacrilege to not include the famous bull sign from the Bull Durham movie. Here it has been supersized as it sits over the left field wall. They also made it double sided so you can see it from the field as well as you are walking along the Blue Monster concourse. The immortal words “HIT BULL WIN STEAK and HIT GRASS WIN SALAD”. After a Bull home run the eyes light up red and smoke blows from its snout. Down the right field line there is a section with tables and chairs where you can sit and watch the game while from one of the numerous concession stands. Knowing that Carolina is such a great craft beer state it helps that the ballpark has embraced it with numerous options of North Carolina based beverages. 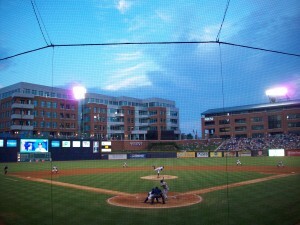 There is a Carolina Brewery stand behind home plate and a large Foothills Brewing Company Beer Garden along the first base concourse along with Fat Tire and Sweetwater around the stadium. You can also find one of our favorites, Natty Greene’s at certain concession stands in the park. 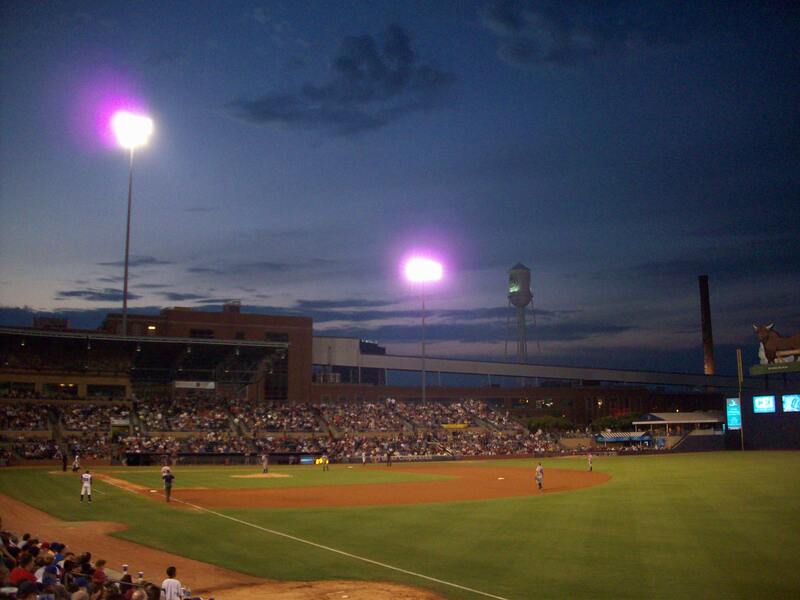 One other item of note, The stadium where the movie was filmed, Durham Athletic Park still exists. And thanks $5.5 million renovation in 2008 hosts baseball regularly again, though it serves mainly as a training ground and park for Babe Ruth level baseball. If you have any interest in Minor League Baseball and its history (and we imagine you do since you are reading this) do yourself a favor and stop by this gorgeous ballpark. Baseball Nerd Fact #8 In the movie, when a ball hits the HIT BULL…sign, it’s a homerun. In reality, the sign was outside the right field line, and would have been a foul ball, not a home run. Brew Basics: new, with a lot to work out, but a lot of potential as well. 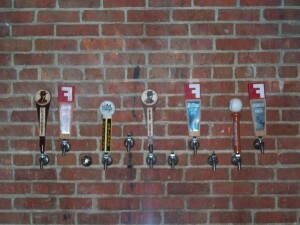 Fullsteam is a still-young brewery that is firmly establishing itself in the Durham area. Since our first visit in 2010, they have followed up on several of our suggestions – not that we’re taking any credit for that – and added several simple additions that add a lot to the atmosphere. Among these include a needed paint job, and a wall of contributors, complete with some very neat artwork from the same group that designs their labels. 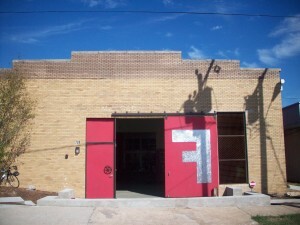 Housed in a large warehouse, Fullsteam has several rooms, including the entryway/seating area, the main room complete with pinball, ping pong and a stage, and a smaller specific bar area off to the left of all this. They also have a back room where the brew works are housed and a few outside spots as well. It’s a neat building, with a lot to look at, fortunately you are free to roam at will. The atmosphere they are going for is communal; they want you to feel like you’re drinking among friends, and this has a lot of pluses -and a few minuses. The biggest positive is the comfort level; it’s really like hanging out in an apartment complex in college. There are people of all different walks of life hanging out and holding various conversations, patrons playing games, and music, and there is even a strip of white board running the length of the bar that you can doodle on should you be so inclined. Somewhere in between plus and minus, children are allowed to hang out at Fullsteam. This can be considered a plus for parents who want to go hang out without always having to get a babysitter, or could be a minus for the kid-less who don’t want to have to deal with small children when they go to a bar. It’s all about perspective. The biggest minus we have found with Fullsteam is the staff. Overall, they are friendly, but need to be engaged before talking to you, and tend to gravitate to friends and locals as opposed to new comers. They’re good on giving you one on one personal service, but this is two sided as you frequently have to wait quite a while before being able to get their attention or another beer. 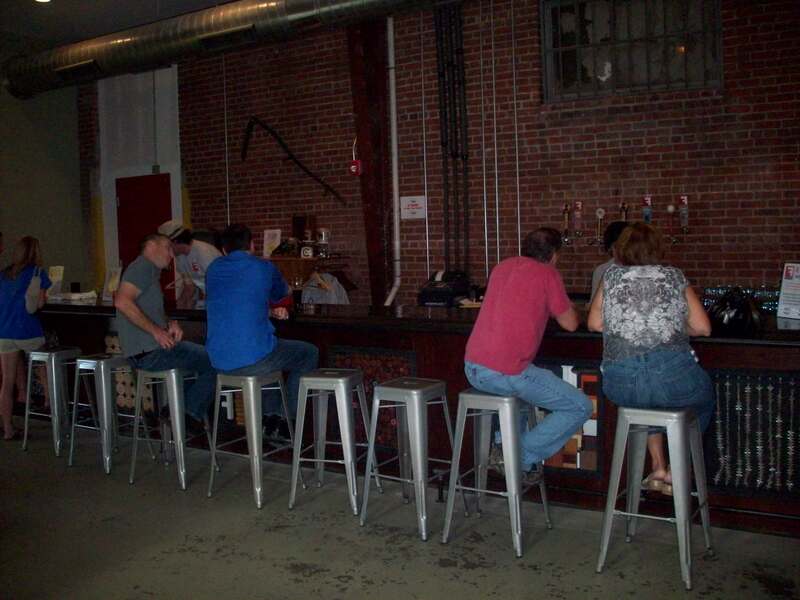 Having no food of their own, Fullsteam is truly just a brewery and a bar; but that, combined with the fact that is is tucked away in a warehouse district hasn’t deterred their fans, who form a solid, consistent crowd any time, any day of the week. Steadily increasing in popularity, there was a line at the door to try their limited edition First Frost on the day of its annual release, and they have added keg countdowns to several of their other special brews so you know just how much is left. They’ve also solved the no kitchen problem, and have been able to make some agreements with several local food trucks that come park outside. An ingenious move that supports local businesses and provides Fullsteam their own, (albeit temporary and ever changing) kitchen, and keeps patrons from leaving with hunger strikes. 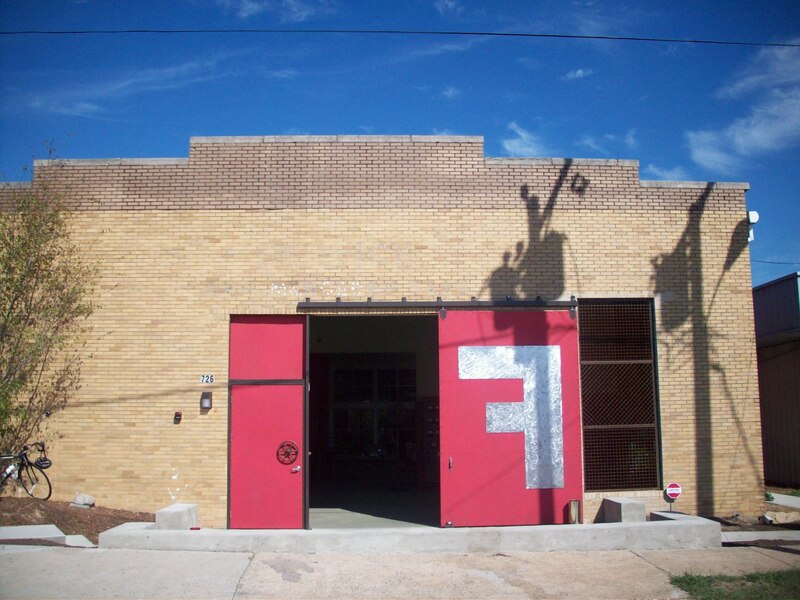 Brew Breakdown: One of our favorite things about Fullsteam, and again something we contribute to the laid back atmosphere is the lack of smugness about their own beers. Of course, anything that Fullsteam has to offer is available for purchase, but they’ve got several guest taps, which are all local (so immediate competitors beers) and they don’t upcharge or promote their own beer over the others. We enjoyed being able to sample several Carolina specials (even better, there are multiple sizes to try – which makes it possible to taste quite a few. 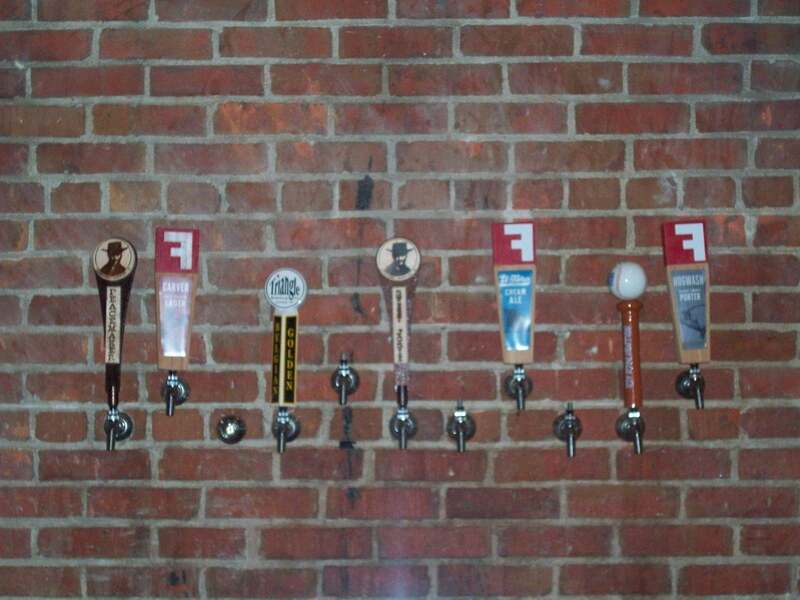 This was commonplace when we visited Utah, but seems slower to catch on back east) and the taps themselves are hooked directly into a brick wall, adding a really cool touch. Carver Sweet Potato Lager (5.8% ABV) This unusual style was inspired by the fact that North Carolina produces more sweet potatoes than any other state, and uses 250 pounds of locally grown (obviously) sweet potatoes in every batch. Light bodied and a bit earthy in aroma, this one doesn’t have a ton of taste upfront but turns sweet, and finishes with a sweet, smooth aftertaste. El Toro Cream Ale (4.8% ABV) – Not a beer style we were terribly familiar with. Very light, smooth, but not thick and or creamy. Actually tasted a lot like a Coors. A very light, slightly wheaten beer that was pale in color and not terribly carbonated. Decent, but plain – good for lite beer drinkers, or those who are still working on developing a taste for craft beer. Hogwash! Hickory Smoked Porter (5.5% ABV) – Hands down the best beer available. Considering the first two we tried fell into the “good, but not great” category, we were shocked by the Hogwash. First by the aromatic and unmistakably smoky smell, and then by the full frontal assault on your taste buds. This beer was like drinking a glass of beef jerky. According to Fullsteam, they smoke the barley before they even start brewing this one. Note of fair warning, this beer isn’t just popular with us, and therefore it can be very hard to come by. Chattham County PawPaw (8.8% ABV) – Only 11 kegs left on the countdown when we were in town, this is a really yellow beer with visible carbonation. It is sharp and sparkly on the tongue, with no head or lacing.. The Chattham County is a Belgian Strong Ale, filtered and served in a wine glass, which is appropriate because it has a sweet, faintly juicy aroma and a palate similar to sweet white wine, with fruit upfront, the alcohol and hops bittering it slightly through the sip that finishes light and sweet. Gillian liked this one a lot. Working Man’s Lunch (5.8% ABV) This is a dark chocolate ale, the color of root beer. The aroma is unique that is a blend of chicory, herbs and chocolate that the bartender attributed totally to the cocoa leaves. We looked it up and discovered this is another of their beers brewed with local ingredients, this time chocolate bits from Raleigh. Smooth but effervescent on the tongue even without visible carbonation. Not light, but not too heavy either. A good, drinkable dark beer. Fullsteam Southern Lager (5.5% ABV)– has a mahogany iced tea color that is much darker than a traditional lager, and an aroma of coffee and roasted malts. The latter being the most distinct part of the Southern’s palate. A slow starter, but flavor kicks in at the end and lingers in the aftertaste. Rocket Science IPA (6.8%) – comes with a strong amber coloring and smells almost sickly sweet, like simple syrup. Coming off that aroma, the tart, earthy taste with pronounced grains, wood (but not smokey) notes and significant bitters is a surprise. This beer was an adjustment from the others, but good, slightly spicy and full bodied. IGOR (8.1% ABV) – A dark, almost black beer with khaki colored head. The smell is smooth and sweet, initially it is that of smoked meats. The bourbon and malts blend well and both are pronounced significantly in smell and aftertaste. IGOR finishes with just a hint of sweet, which is nice because it’s not like taking a shot of liquor with each sip as some bourbon barreled beers can be. Bonus beers: As mentioned, we were able to try some other local beers from Lonerider Brewing, even though this Raleigh based brewery is closed on Sundays. One was intentional – Gillian ordered a Sweet Josie Brown which both bartenders likened to brown ale, but was reminiscent of a stout with a strong coffee taste. The other we tried unintentionally; when Jim ordered the El Toro, the bartender poured him a Lonerider Peacemaker instead. To her credit, she admitted the error about 5 minutes in, and poured Jim a glass of his original order for free. This beer was definitely hoppy, as any good IPA should be. Both Lonerider beers had such strong, complex flavors, they took some getting used to, but we ended up enjoying both, and will make it a point to visit the brewery itself next time we are in the Raleigh/Durham area.